Facebook’s new algorithm change has affected a Facebook page called LittleThings that was popular for it’s viral content. It is reported that the business owners claimed their traffic decreased by 75%. It remains to be seen how many other businesses that depend on Facebook will begin to wither as the toll from the algorithm takes effect. Jonah Peretti of BuzzFeed recently offered his insights on how to thrive in the capricious and constantly changing social media environment and to avoid becoming another social media business casualty. Jonah Peretti, CEO of BuzzFeed, discussed building a viable business with social media. Perhaps failing to build a multi-revenue business model contributed to the collapse of the LittleThings viral Facebook page. The entire business model revolved around the Facebook Page doing the same thing over and over, with followers sharing and reacting to the viral content. A similar thing happened to businesses when Google introduced the Panda Algorithm. Business models based on mass producing content (content farming) lost substantial traffic. This is what happens when businesses fail to diversify their revenue streams, fail to cultivate multiple sources of traffic and fail to experiment with creating different kinds of content. It is important to always be trying new things, just like BuzzFeed does, in order to cultivate new sources of business. This is the quality of adapting, to constantly be in a state of change and innovation. Some directions are fruitful, many may not. LittleThings focused on doing one thing over and over. They were successful at that one thing. But their business model did not represent the kind of content Facebook wanted in their news feed. And when the news feed algorithm changed, the LittleThings Facebook audience collapsed. What Facebook is asking from content creators is to create content that engages people, that Facebook members will discuss with each other. Jonah Peretti stressed that focusing on the user reaction is at the top of considerations. It’s not important that a user shares or reacts to content. His goal was for content to engage readers offline, as well as online. BuzzFeed’s CEO is right on the money to focus on user experience and engagement. Facebook’s new feed algorithm is focused on meaningful interaction, something Facebook has been after for at least a year. There’s are lessons in this event for anyone doing business via social media or through a website. It’s important to diversify traffic streams, diversify monetization streams, and to diversify content (or product) models. But perhaps the most important lesson is to focus on user experience and engagement. It’s not always enough for a user to like or share a page, it sometimes may be important to motivate them to engage in an activity in the real world, offline. Backlinko has done an extensive analysis of “voice search ranking factors” and identified 11 variables tied to appearing in Google Home results. The company examined 10,000 results delivered over the smart speaker. What Backlinko found was consistent with what many others have been saying but there were also a few surprises. For example, the study discounts the impact of Schema to some degree and page authority. Shema may not be a factor: 36 percent of pages voice search results came from pages using Schema. Google has made page speed an explicit mobile ranking factor. Backlinko found that the page-load time for a voice result was almost 2X faster than traditional webpages. Not a surprise. What may be a surprise are the findings around Schema. There are plenty of reasons to use Schema generally so this finding shouldn’t be seen as an argument against it. And many will question the validity of this finding. It may also be that Schema pages don’t appear more because they aren’t more prevalent and there are other important variables. We discovered that the average Domain Rating of a voice search result was 76.8 . . . we found that the link authority of voice search result pages were significantly lower. In fact, the mean Page Rating of a voice search result was only 21.1. Backlinko speculated that the voice algorithm was relying upon domain authority (over page authority) because that provided a higher level of confidence in the accuracy of results. SEOs should review the post and do their own evaluations of the findings and recommendations. While it’s not clear whether smart speakers will siphon off some query volume or merely be additive to the overall pie, at least two studies have shown that owners of Alexa and Google Home devices are spending somewhat less time with their smartphones. Regardless, virtual assistants are emerging as an important consumer discovery tool and marketers need to take these platforms seriously and adapt accordingly. In Google’s case, the Assistant (which powers Google Home) is now available on 400 million devices. Google is updating search results with a new type of featured snippet which is designed for queries that have multiple interpretations. Multifaceted featured snippets may appear for queries such as “ears popping on a plane,” where the individual may be searching for either causes or remedies. Examples of multifaceted featured snippets are shown below for the ambiguous query “garden needs full sun?,” which could be looking for one of two different answers. Google will start by introducing multifaceted featured snippets with “multi-intent” queries, where the intent behind the query could be interpreted in different ways. Eventually, Google plans to expand multifaceted featured snippets to cover more query types. For example, a query like “is my house worth fixing?” has several different components that could be equally important. Today we are introducing more powerful ways to manage access to your Analytics accounts: user groups inside Google Analytics, and enforceable user policies. These new features increase your ability to tightly manage who has access to your data, and amplify the impact of the user management features we launched last year. User groups can now be created from and used within Google Analytics, simplifying user management across teams of people. This is a big time saver if you find yourself repeatedly giving out similar permissions to many people, and simplifies granting permissions as individuals rotate into or out of a team. To start with user groups, visit either Suite Home or Google Analytics, navigate to the user management section, and click the “+” button. You will then see an option to add new groups, which will walk you through creating a user group, adding people to it, and assigning permissions to the group. Here is a full list of steps to make a user group. Google Analytics 360 Suite user policies let you define which users will have access to your Analytics accounts, and which do not. When a user violates a policy, you will be warned of this through the user management section in Google Analytics or Suite Home and have the option to remove that user from your organization. User groups and enforced user policies are supported in Google Analytics today, and support for more products is coming, as we continue to plan features that help customers better manage access to their critical business data. Multifaceted featured snippets will be surfaced for queries that are sufficiently broad enough to allow for more than one interpretation of what was submitted. In these instances, the SERP returned will include more than one featured snippet, with the original query rewritten as the questions the algorithm assumes the user may have intended, and the results displayed in the multifaceted snippet will reflect those new questions. Back in December, Bing began rolling out AI-powered multi-perspective answers as part of its “Intelligent Search” set of new features, which includes Intelligent Answers, Intelligent Image Search and Conversational Search. Multi-perspective answers are just one of the “Intelligent Answers” features that has been live since the rollout. These results surface two (or more) authoritative sources on a topic, and will typically include differing perspectives/answers to the query. Bing leverages its deep recurrent neural network models to determine similarity and sentiment among authoritative sources, and extracts the multiple viewpoints related to a topic — providing the most relevant set of multi-perspective answers (covered in more detail here). Google’s multifaceted featured snippets may appear not too dissimilar from Bing’s multi-perspective answers, in that they also provide multiple rich results for a single query, but they are instead based on the presumed multiple intentions of a query (resulting in both multiple queries and results) vs. multiple viewpoints resulting from a single query. With these types of broad queries, many interpretations of what the user is actually asking can exist. Google plans to expand multifaceted featured snippets throughout 2018 to include other nuanced query types — beyond those that could have multiple intentions — and lists guidance-seeking queries as one example. With both Google and Bing having fully adopted deep learning methods and using artificial neural networks to drive search advancements, we can expect to see a steady stream of changes in search results enhancements and improved information discovery. As always, Google encourages users to submit feedback on these new search features as you encounter them in the SERPs. Read Google’s full announcement here. We knew this day was coming, he announced he was leaving the company he founded with his mother and that day has come. He posted about it last night on his new company blog, SparkToro. The picture you see above is from there as well. SparkToro is a software product and data service to help marketers, public relations professionals, and entrepreneurial teams learn more about the audiences they want to reach. And Rand is leading that up. 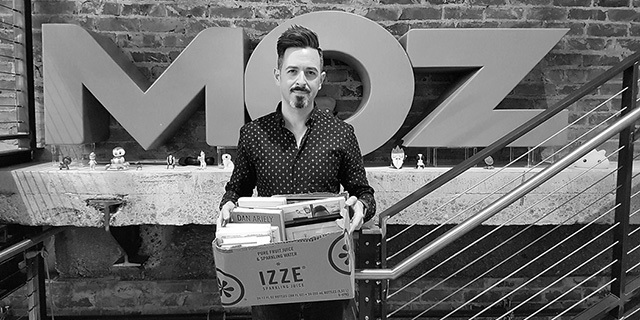 He wrote a very detailed and transparent blog post about his departure from Moz, a company he founded about 17 years ago (which wasn't named Moz back then). On a scale of 0-10, where 0 is “fired and escorted out of the building by security” and 10 is “left entirely of his own accord on wonderful terms,” my departure is around a 4. That makes today a hard one, cognitively and emotionally. I have a lot of sadness, a heap of regrets, and a smattering of resentment too. But I am, deeply, deeply thankful to all the people who supported me and Moz over the last two decades. The experience of building a company like this, of helping to change and mature an industry, of learning so much about entrepreneurship, marketing, and myself has been an honor and a privilege. I wrote a little bit about how instrumental Rand is to the industry in the past. This is a sad moment for the industry but also should lead to new exciting things. Rand - thank you for everything and we are looking forward to seeing what you come up with in the future. You can drop a note on Rand's blog post or on his tweet wishing him well. Google has a habit of not confirming updates to their algorithm even though web publishers see that the search result are changing. Is Google purposely hiding what they are doing in order to protect their algorithm? I have collected evidence that arguably shows there is an answer to explain why Google denies something is going on when publishers insist nothing unusual is happening. Centuries ago it was understood that the sun revolved around the earth. You could see it with your own eyes. The idea that sun revolved around the earth was a logical conclusion supported by the evidence. The problem of course was that, unknown to medieval citizens, there was a considerable amount of evidence missing. So the 100% logical conclusion that the sun revolved around the sun was wrong. As the true history about our understanding about the suns orbit illustrates, logical conclusions can be wrong. It’s also a scientific fact that logical conclusions can be wrong. The business model of so-called “black hat” affiliate websites is to rank sites with methods that violate Google’s guidelines, and keep creating new sites as the older sites lose rankings. This is called the churn and burn business model. It’s similar to how fish reproduce in the wild, by producing millions of eggs to compensate for the loss of most of them to predation. It’s not notable if a so-called “black hat” affiliate site loses ranking. What’s notable is if a single day goes by and a “black hat” site does not bite the dust. The chatter of sites losing rankings does not cease. Chatter on black hat forums about ranking losses are a daily occurence, not the exception. So it cannot be cited as evidence of a Google update. You can tell because there is almost always disagreement as to whether it was links or content that Google was targeting. Most Times it’s not Google. I remember at Cre8asiteforums, when an update at Google would be announced, how many people would show up with some slow traffic, and ask if they were penalized. The last thing to look at was whether the impact was due to a change on the search engines level, because it rarely was. Google has traditionally been open about algorithm updates. Every major infrastructure and algorithm change has been announced after it was implemented. 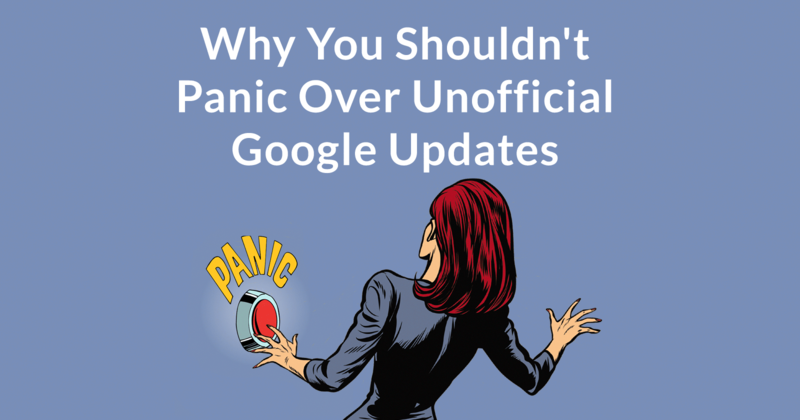 Tellingly, except for update Penguin and Update Florida, most Google udpates passed unnoticed until they were announced. What to Do if Your Rankings Change? The first thing to do is understand what a Core Algo Ranking Update is and how to diagnose ranking changes. Some of the changes could be due to a test and often the search results return to normal within ten days, sometimes as long as a month. The important thing is to not panic and start making changes before a proper diagnosis of what actually changed.